Become a Sponsor - help Living Legends of the Trail Run their gReat Last Race from the Trail to the Couch! Scroll Down to See ALL Our sponsor categories! 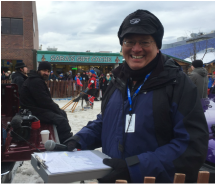 David Pike, attorney and owner, Pike Legal volunteering at the Ceremonial Start of Iditarod 2016. "Three...Two... One... GO!!!" If you've watched the start of the Iditarod each year, you would have heard David Pike, of Pike Legal, a Kentucky based law firm with offices in Florida and Alaska, counting down to the start of each team at the ceremonial start in Anchorage. Pike Legal's Annual Friends of Mushing: Each year Pike Legal selects a kennel and musher to sponsor in the Iditarod. In 2016 - 2017 they've decided to feature the athletes actually pulling the sleds—the dogs. Welcome to Pike Legal's Friends of Mushing and Mush thanks for David Pike and PIke Legal's financial and promotional support of our efforts! ​An Alaskan based wellness company offering the highest quality full spectrum CBD hemp oil. Discover the endless benefits of CBD with our Vape Oil and ingestible CBD Oil for you & your furry friends. ACE sponsors our foster dogs with CBD oil, helping improved their health and well being naturally. You can also purchase through us with proceeds going back to help the dogs! ORDER HERE! Dr. Bob Sept operates his own private veterinary practice in Chugiak, AK as well as traveling to Bethel and King Salmon regularly to provide vet care. Dr. Sept spent much of his career heavily involved in the Iditarod Trail Sled Dog Race as Chief veterinarian and Race president. He received the Iditarod Golden Stethoscope Award in 2000. In 1997 he was inducted into the Alaska Dispatch sports hall of fame. Dr. Sept graciously discounts and donates his fees and time to provide care for many of our retirees. Arctic Tails provides a space for fostering an August Foundation retiree at their facility, grooming of new retirees, as well as promoting our organization to their clients. Dr. Carson’s ® PRO-DOG Supplements combine only the finest all natural ingredients to promote the health and well-being of your pet. Ingredients from the HONEY BEE HIVE promote healthy skin and coat as well as inner cleanliness and immune building properties. Dr. Joe Carson, the beekeeper and soon to be Iditarod veteran, provides our retirees with discounted supplements to help our retirees live a long healthy life.